Cook Family Funeral Home - Proud To Support Our Community! Thank you to all the good folks for your generous donations this year! The toy drive was a success due to your kindness! - Please join us for the "Toys For Tots" Campaign in 2018! 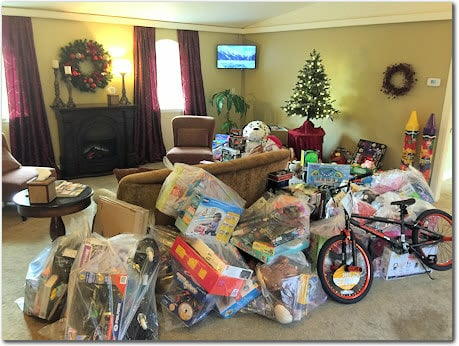 Cook Family Funeral Home sponsors the US Marine Corps Toys For Tots program during the holiday season. Throughout the many years, thousands of toys have been donated to help children in need. The 2018 Toy Drive will begin November 17th and end December 21st. Please bring your toy donations to the funeral home (163 Wyatt Way NE). We will also be collecting funds and food to benefit The Helpline House on Bainbridge Island. As always, we will be showing a free movie for all of the kids in our community!!! Parents are welcome too!!! This year we are featuring the movie "Happy Feet" in conjunction with our good friends at Bainbridge Cinemas! Look for the announcement on a separate page with dates and times! !